I know some people who love to chase butterflies but are freaked out when it comes to dragonflies. When I ask them about it I usually get an answer something like dragonflies are bugs. Then I explain that both dragonflies and butterflies are insects. 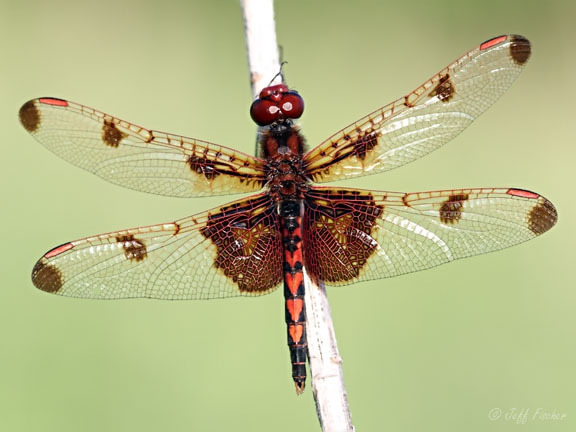 But butterflies are pretty they usually tell me and so I ask them if they have ever seen a calico pennant. On the pretty scale calico pennants are a match for any butterfly. The male, seen above, is mostly red with red spots that look like hearts running up the abdomen. The female and young have mostly the same pattern except they are bright yellow instead of red. Amazing shot! Such a beautiful dragonfly!